India has a tremendous potential to contribute meaningfully to clinical research while matching with the global pace, at par with regulatory guidelines formed by global regulatory bodies. In the past few years, India's regulatory scenario has witnessed a positive transformation to favor ethical conduct of clinical research. 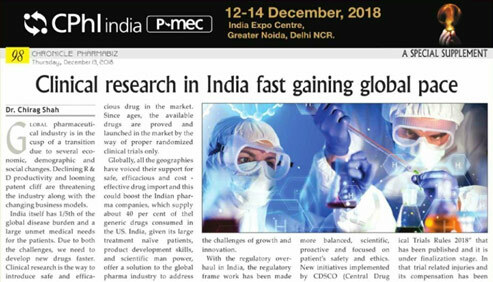 Read more about how clinical research in India is gaining Global pace in Article by Dr. Chirag Shah, Sr. Director - Business Strategy in Chronicles Pharmabiz. As we know the Respiratory Clinical Development is becoming more and more challenging due to several reasons. There is a specific need for exchanging clinical, regulatory and bio-analytical science amongst the stakeholders in clinical development. Fulfilling this, Cliantha Research Limited organized a Respiratory Symposium on 17th November at Hotel Taj Santacruz, Mumbai. The symposium featured an array of immersive experiences of Respiratory Clinical Research by globally distinguished experts. 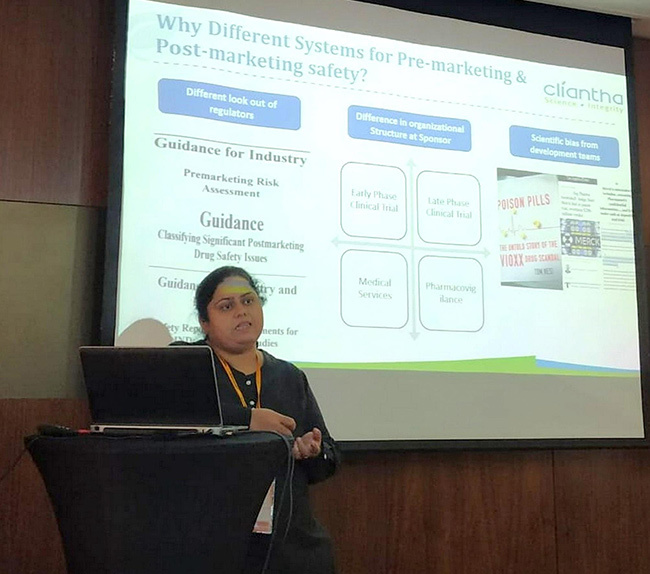 About 125 industry experts attended this unique symposium, including senior delegates from Pharma, Life-science and Clinical Research industry as well as leading pulmonologists from all corners of India. The symposium witnessed the enriching scientific discussions and interactive sessions by Keynote speakers Dr. Parameswaran Nair MD, PhD, FRCP, FRCPC, Respirologist at St. Joseph's Healthcare Hamilton, Canada and Dr. Sundeep Salvi MD, DNB, PhD (UK), FCCP (USA), Hon. FRCP (Lon), Director of the Chest Research Foundation, Pune, India along with other experts Dr. Piyush Patel MD, FRCPC, Principal Scientist, Inflamax Research (Cliantha Group), North America; Dr. Anne Marie Salapatek MSc, PhD, Executive VP & Chief Science Officer, Inflamax Research (Cliantha Group), North America and Dr. Chinna Pamidi Ph.D, President/Head of Operations, Hill Top Research (Cliantha Group), North America. 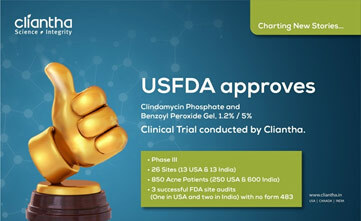 Cliantha has once again successfully completed its 5-days comprehensive USFDA inspection at Mississauga site. 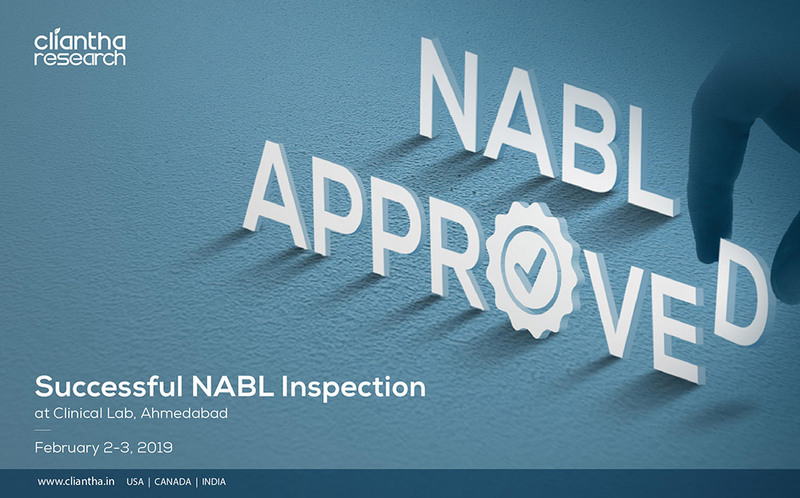 This portrays our impeccable regulatory track record & coming out with flying colours after such comprehensive inspection with no form 483, depicts our adherence to quality parameters. Another successful unannounced USFDA inspection in the kitty. Cliantha has successfully completed its 18th multi-centric site inspection. It was an unannounced inspection & successful completion immaculate our regulatory and quality track record in clinical trials. The inspection was conducted in Osteoarthritis indication at Himmatnagar site between September 17 to 20, 2018 & was concluded without any observation. Clearance of such unannounced inspections depicts our strict adherence to quality parameters. MedDRA is used by worldwide regulatory authorities in the pharma industry as part of the regulatory process. Currently, the major version of MedDRA is 21.0, which has been updated to 21.1 on 1st September 2018. An internal training was held at Cliantha under the auspices of Dr Ripal Gharia, AGM-PV & Medical Services, where more than 30 members of Cliantha Research Limited participated. Inflamax Research specializes in the conduct of Phase III clinical studies for respiratory diseases such as asthma and COPD. We have been awarded two large, Phase III clinical endpoint studies in patients with asthma. Particularly, we have experience in helping clients who are developing generic inhaled products realize approvals based on the required clinical studies. These can be for identical generic products or for those products which take a 505B2 type approach for the FDA. 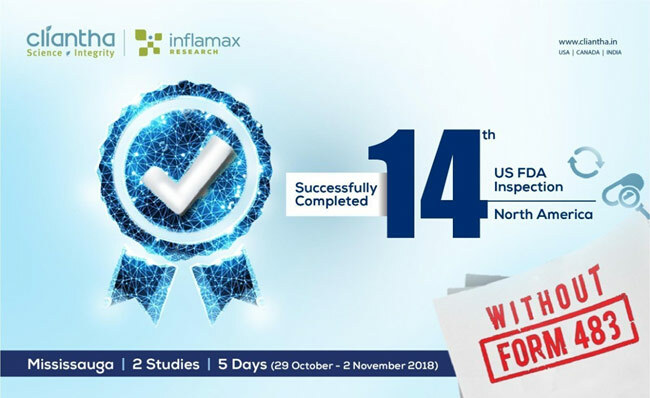 Inflamax is also working currently with our Sponsors to perform the complete clinical programs required for generic inhaled products and conducting the Pilot studies > Pivotal PK Studies > Clinical Equivalence/PD Studies. This can streamline the outcomes for the study program for inhaled products. We have worked with our clients to gain time and cost efficiencies by working across the Cliantha globally to conduct such large inhaled trials in both North America and India. This also has advantages of satisfying the regulators requirements to have multiple jurisdictions but also to include North America. India unlike the US, has a high degree of respiratory disease in which patients are treatment naïve and for which recruitment can be facilitated. Inflamax will be talking about this approach at a Cliantha Respiratory Symposium in Mumbai, 17th November, 2018 entitled, “Respiratory Research: Insights into the Clinical Development of Respiratory Drugs”. Please contact Ms. Geetu on gbulchandani@cliantha.in for more information on these topics or on the Cliantha Respiratory Symposium. Inflamax Research will utilize the EEC technology to study a novel New Chemical Entity (NCE) in Subjects with Seasonal Allergic Conjunctivitis using the Environmental Exposure Chamber (EEC) for a US-based sponsor. FDA is open to utilization of the EEC towards Phase II and Phase III studies in allergic conjunctivitis. The EEC brings together the best approach of a controlled allergen exposure that is less variable than traditional field trials and more naturalistic than the high dose direct instillation conjunctival allergen challenge. This double-masked, vehicle-controlled, randomized, three-way crossover clinical trial allows for the testing of two concentrations of the test product versus vehicle in subjects with ragweed-induced allergic conjunctivitis in the EEC. 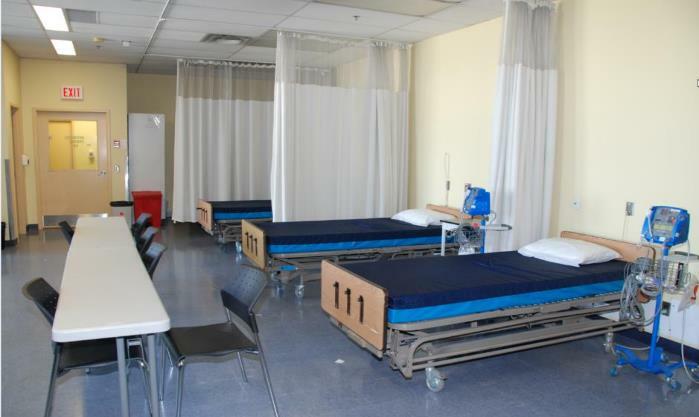 The EEC clinical research facility is a room designed with the capacity and control mechanisms to expose participants to airborne ragweed pollen grains and maintains target temperature and relative humidity throughout. The controlled exposure to allergen in the EEC takes away the variability seen in field trials that are often the reason for failed trials such as failure of environmental pollen release due climate change and other environmental factors. At the same time, the environmental exposure chamber is more naturalistic than the direct instillation conjunctival allergen challenge which may be a high level of allergen exposure that may make efficacy of ocular preparations on ocular hyperaemia and itching difficult to discern. This may particularly helpful for new drugs that work locally by unique mechanisms. Inflamax has been awarded a FIH study to study a novel allergen immunotherapy. This combines Inflamax’s unique expertise in allergy as well as to conduct Phase 1 FIH studies. Inflamax Research has conducted many studies in ragweed allergy and has been successful in meeting recruitment targets in Phase I-IV ragweed allergy studies. This study will have primary endpoint of safety and will include some efficacy assessment towards insight into effectiveness of treatment and mechanism of action. This study, a FIH Study, will be for our European client to study an innovative product to help with ragweed allergy. Inflamax’s extensive database, social media recruiting expertise and experience working with the allergy community will make this possible. In this way, Inflamax can also work with our Sponsors in key therapeutic areas to provide full development from Phase I through to Phase III study services. Inflamax has much experience and expertise in the performance of environmental studies towards examination of emissions from tobacco products and e-cigarettes. Inflamax leading work in this area has been published last year in the International Journal of Environmental Research and Public Health. Inflamax is now performing a unique Environmental Exposure Chamber single center study in our Environmental Exposure Chambers to evaluate selected constituents in the environment from the use of e-vapor products compared to conventional cigarettes studied under different environmental conditions of residential, office and hospitality environmental conditions. These form important studies for our Sponsors towards necessary regulatory information on emissions. Inflamax Research’s Executive Vice President & Chief Scientific Officer, Dr. Anne Marie Salapatek, and Cynthia Day O’Brien, Senior Director of Business Development attend the recent Tobacco Science Research Conference, held in Memphis TN (USA). This was an important conference for tobacco product developers. 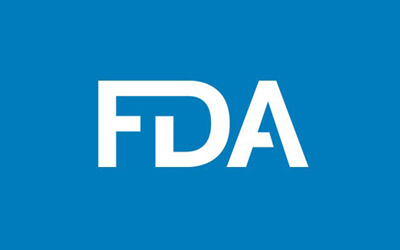 The Center for Tobacco Products (CTP) of the FDA was present and provided key information on their expectations for the Tobacco Research and their willingness to work with stakeholders to share information. Among the clients we met with were RJ Reynolds (RAIS), Japan Tobacco Inc., Altria, Swedish Match, Scandinavian Tobacco Group and JUUL Laboratories, amongst others. 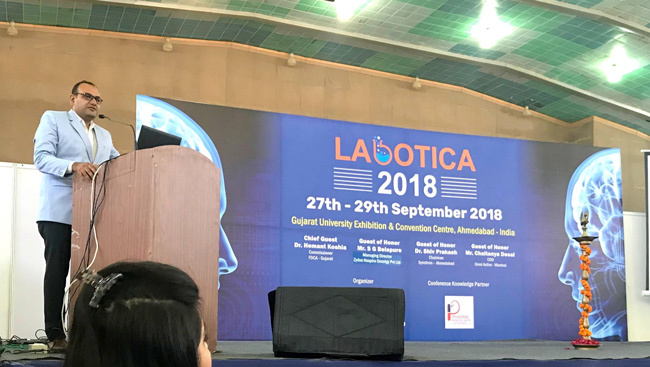 Mr. Nayan Prajapati, Head – Training, Cliantha Research Limited delivered a session on "Good Laboratory Practices” in Asia Labex LABOTICA - 2018 held at Ahmedabad on September 27, 2018. Cliantha has successfully completed its unannounced 5-day comprehensive USFDA inspection from 30 July 2018 to 3 August 2018, which portrays our impeccable regulatory track record. Coming out with flying colors after an unannounced USFDA Inspection for the review of 13 studies with no Form 483 issued, depicts our adherence to quality parameters. Successful completion of unannounced USFDA BIMO Inspections at Clinical Investigator Sites. Where every experience counts, Cliantha Research has once again successfully completed its 16th & 17th clinical trial study inspection which portrays our impeccable regulatory and quality track record in clinical trials. The inspection was conducted at Pune (May 30’ 2018 to June 01’ 2018) & Gandhinagar site (May 28’ 2018 to June 05’ 2018) on Patient based clinical study in Psychiatry indication & both the inspections were concluded without observation. Clearance of such unannounced inspections depicts our adherence to quality parameters. WHO (World Health Organization) successfully completed its 4th audit at HQ and Sigma locations, Ahmedabad from June 25 - 29, 2018. The scope of inspection comprised clinical and bioanalytical. There were no critical findings. Inflamax Research specializes in the conduct of Phase I-IV clinical studies for NCEs for respiratory diseases such as Chronic Bronchitis. We are currently supporting a dose finding study in patients with Chronic Bronchitis that includes key mechanistic and biomarker outcomes. This work will allow our clients to be able, at an early stage, to demonstrate mechanism of action and efficacy. This can be used to garner further investments in the development of these molecules products and program development. Inflamax is performing a unique Environmental Exposure Chamber single center study in our Environmental Exposure Chambers to evaluate selected constituents in the environment from the use of e-vapor products compared to conventional cigarettes studied under different environmental conditions of residential, office and hospitality environmental conditions. Inflamax is using its well-recognized clinical facility that controls and mimics various environments for the study of disease and environmental studies for studying these types of products for clients who seek to understand how these products perform in various environmental conditions. This data will support new marketing claims for mainstay marketed products, but also for over the counter (OTC) markets and those products still in the R & D phase. Inflamax has expertise in environmental studies for the tobacco and e-cigarette fields as shown in our publication entitled Determination of Selected Chemical Levels in Room Air and on Surfaces after the Use of Cartridgeand Tank-Based E-Vapor Products or Conventional Cigarettes in the International Journal of Environmental Research and Public Health (Int. J. Environ. Res. Public Health 2017, 14, 969). Peanuts are one of the food allergens most commonly associated with anaphylaxis, a sudden and potentially deadly condition that requires immediate attention and treatment. Inflamax Research conducts studies in food allergy and is currently successfully meeting recruitment targets in an international pediatric peanut allergy study for our European client to study an innovative product to help peanut allergy. We have successfully recruited both adult and adolescent subjects, and are now embarking on the recruitment and testing of pediatric subjects. 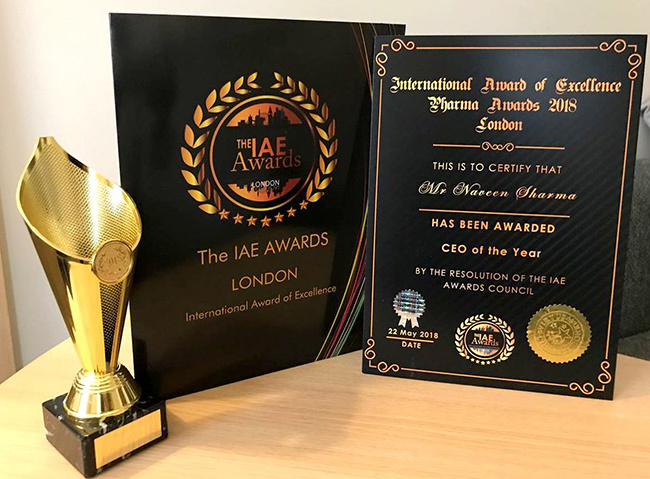 Inflamax’s extensive database, social media recruiting expertise and experience working with the allergy community has made this possible..
Mr. Naveen Sharma, President - Cliantha Research Limited has recently earned the honourable “CEO OF THE YEAR” AWARD at the IAE (International Award of Excellence) Pharma Awards 2018. The prestigious IAE awards endeavour to reward and recognize the excellence in the Global Life Science sector at various levels. 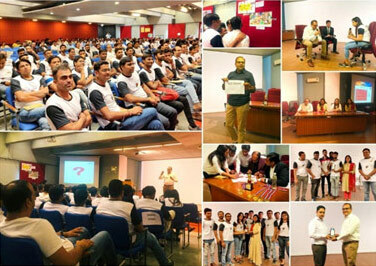 Training & development acts as a catalyst in being competitive. Cliantha Research is one of the few CROs conducting such training sessions so that our employees have a competitive edge. This extra mile which we walk very often fetched us an award. 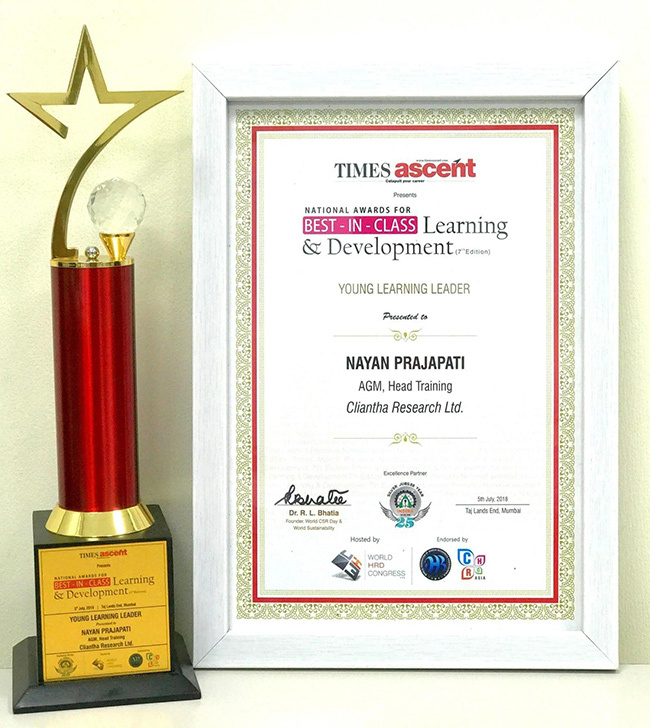 Our lead trainer Nayan Prajapati won "Times Ascent - Young Learning Leader Award" at National Awards for Best In Class Learning & Development (7th Edition), Mumbai on 5th July 2018.